Get Rid of Those Scars! Scars are a common complaint of people of all ages. The process to remove and prevent scars depends on its location, size, shape and type of the scar. • Whenever you have a fresh cut or scrape, wash the wound with cool running water. Clean the surrounding of the wound with soap. Do not use irritants such as harsh soaps, hydrogen peroxide or alcohol. It can actually delay wound healing. • Keep the cut covered to prevent it from dirt, bacteria and other irritants. 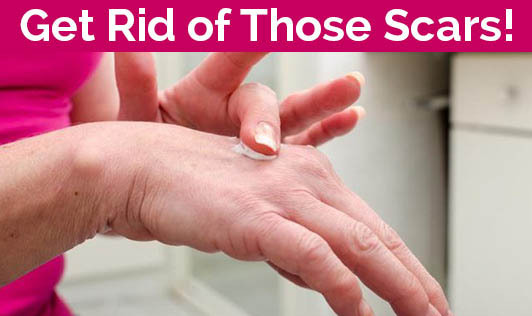 Use an antibiotic cream or ointment. It is a good way of covering the wound and keeping it moist. • When you get a wound, scrape or even a pimple, the body's natural mechanism of healing starts, and white blood cells attack the infection causing bacteria and in no time a scab forms. If you have a habit of scratching the wound, it can reopen and expose the wound to bacteria and this leads to a bigger scar. A wound doesn't need to be deep or severe to leave a scar. Inspite of proper wound care, you can still end up having a scar, as some people are prone to scars. Dermatologists say that areas of skin frequently under tension tend to get scars easily. • If the wound is from an animal, insect or human bite. • If the wound is very painful, shows redness, swelling and pus. • If it is located on your face or eyes. • If the wound is deep and longer than ½ an inch. So watch out to prevent those ugly looking scars, and follow these steps to right wound healing.